The biggest and most positive beer related story in 2018, was Sierra Nevada Brewing Company’s relief effort in response to the devastating Camp Fire that hit northern California in November. The Chico, California, brewery’s founder Ken Grossman expected a few hundred breweries might join the effort he announced in late November to help with recovery. Butte County, California, hit by the fire that claimed 85 lives, is also home to Sierra Nevada Brewing Co. About 50 brewery employees lost their homes in the blaze. 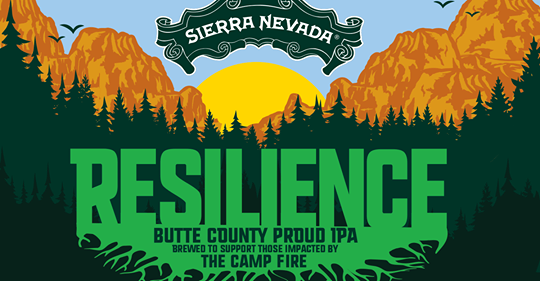 Even before authorities contained the fire, Grossman urged breweries across the U.S. to brew their own Resilience Butte County Proud IPA using Sierra Nevada’s recipe and donate proceeds to relief efforts. “Initially, I was hoping for 200 breweries to sign up, and in pretty short order we had many, many more,” Grossman said. “When we were at 500, I thought that was pretty amazing, maybe we could get to 600 or 700. With so many STL breweries contributing to the Sierra Nevada Resilience Relief effort and following the lead of Sierra Nevada, 2nd Shift Brewing is bringing all the local versions together and hosting a St. Louis Resilience Fest. The cost of admittance is $30 and includes 4 oz samples from each participating brewery, as well as a tasting glass and high fives. Each brewery is bringing an additional beer to pour, excited to see the variety amongst the many versions of Resilience IPA! 100% of the proceeds of this event will be donated to the Butte County Fire Relief effort.